Outside a mountain town grappling with a series of abductions and murders, Paul, a reclusive writer, struggles to start what he hopes will be a career-saving screenplay. After a tense encounter at a diner with a drifter named Jack, Paul offers Jack a place to stay-and soon the edgy, demanding Jack muscles his way into Paul’s work and the two men begin a jagged game of one-upmanship that will bring at least one tale to an end. “First you put a knife to my throat,then a gun to my head. What to do when you’re a writer of best-sellers and you suffer from writer’s block? Yep, you start drinking till you drop. As a result it gets even more difficult to come up with something to write about. And what if you’re witnessing how an unknown young guy grabs an aggressive trucker by the scruff of the neck and throws him out of a road restaurant? Indeed, you invite that stranger to your mountain chalet to hide for an upcoming storm. Two events that’ll get Paul (Antonio Banderas) into trouble for sure. Normally, such stupidities would annoy me right away. But this time it was the end of the movie that pissed me off. Do you sometimes have those moments that you wonder why you actually did all the effort for something and conclude that this effort was ultimately plain useless? Like for example you just cleaned your car devotedly until it shines. And you leave for a relaxing trip around the countryside afterwards. And all of a sudden you cross a manure spreader whose sealing malfunctions, after which your newly washed car is being smeared with excrements. Well, I also had that feeling at the end of this movie. “Misery” without losing his legs. Paul (Antonio Banderas) is a disgraced ex-best seller writer whose life follows a downward spiral. Full of setbacks. His movie scenarios aren’t good enough according to his agent. His wife left him. Whatever he writes isn’t selling anymore, causing financial problems. He can’t even pay his purchases at the local grocery shop. Paul is forced to sell his beautiful cabin in the mountains. Only his real estate broker isn’t doing a great job and can’t see to sell it. And a stubborn drink addiction isn’t helping either. On the contrary. It only worsens everything. And then there’s this little scuffle where a young guy named Jack (Jonathan Rhys Meyers) intervenes. And when Paul is so good to offer this seemingly quiet young guy to stay over for the night, he appears to be a bit psychopathic. Before Paul realizes it, he’s a kind of hostage in his own home. It’s not so difficult to see this movie as variant of the movie “Misery” from here on. The only difference is that there aren’t wood blocks and an axe involved. It’s the beginning of a psychological fight between the two protagonists. 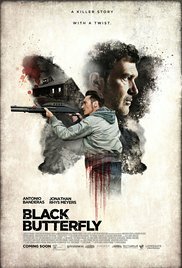 “Black butterfly” isn’t really a bad thriller. And the conflict between Antonio Banderas and Jonathan Rhys Meyers is extremely exciting. In any case, it’s more exciting than the psychological game Travolta and De Niro played in “Killing Season“. The rivalry in “Black butterfly” is much more intense. Unfortunately, there were some developments which turned the whole movie into a banal evening entertainment. There are innocent women disappearing in the region as well. Apparently a serial killer is on the loose. That’s what you’ll see in the introduction. However, after 15 minutes you’ve forgotten this given fact since your attention is drawn to Jack’s intimidating behavior. It should have been 5 minutes shorter. But, as I said earlier, especially the multiple twists were a little bit over the top. If only they had made this movie 5 minutes shorter, I’d probably judge it more positively. Even the acting was of acceptable level. No Oscar-worthy performances, but still convincing enough. I only hope that the career of Banderas isn’t going the same way as Bruce Willis for instance. Turning up in negligible B movies. Because to be honest, the last movie he appeared in (“Security“) was of an equal level as this flick. So if you decide to watch this meaningless movie, can I give you some good advice? Turn off the film 5 minutes before the ending. Guaranteed you’ll say it was a not-so-bad movie.